a capital wasteland: What the Heck is this Noah Thing Anyway? What the Heck is this Noah Thing Anyway? I’m going to go out on a limb and assume at least some of you watched the Super Bowl a while back. The game itself was…boring for the best reason (go Hawks), but that’s neither here nor there. The thing that really keeps people in their seats these days is the Super Bowl commercials. These ads, which are important because they are aired during the single most watched event of the television year, have become an institution in and of themselves and the occasional movie trailer is no exception. This year, a lot of Hollywood’s big players played their hand with their Superbowl trailers. We had a trailers for Captain America 2: The Winter Soldier, Transformers 4: Age of Extinction and The Lego Movie among others. Also, quick side bar: the aforementioned Lego Movie really is as good as you’ve heard. You should go see it. Now. I’ll wait. Oh man...my shoes are going to get so wet. Anyway, despite the big name trailers throughout the game, like me you may have been attracted to a short 30 second spot at the beginning of the game. The movie in question looks like some sort of High Fantasy apocalypse. It’s got Russell Crowe who is generally decent, Emma Watson who is generally hot, and it’s directed by Darrin Arronofsky who doesn’t really make bad movies. It’s also got some cool shots in the trailer like celestial beings falling to Earth and a guy with a fire sword (which is a statement that I wish could be attributed to more movies in general). 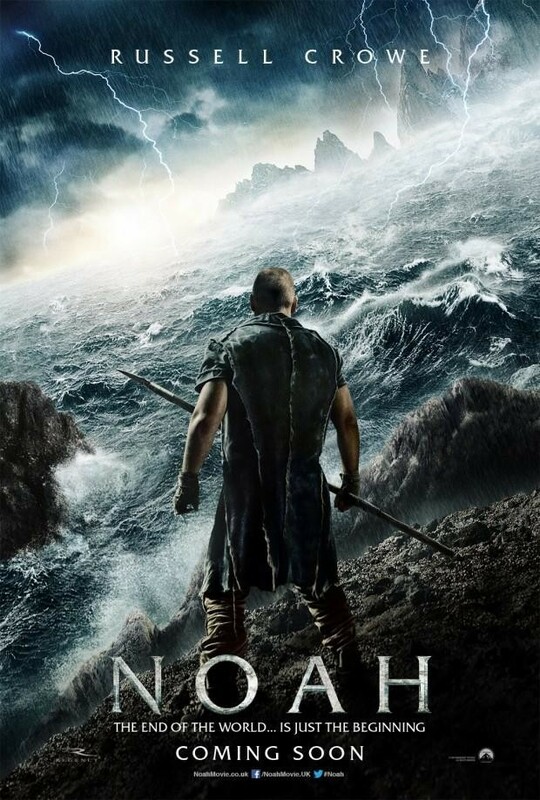 But then the title appears and the film’s name is revealed: Noah. Okay, what? Where was all of this stuff in Sunday school? It certainly would’ve made things a whole lot interesting right? Actually he was a drunk. No really. To understand why a film about Noah’s Ark can look this…unbiblical,you need to understand a bit about the mythology behind it. The basic premise is simple and straightforward. The foundation of the tale is found in Genesis, the first book of the Christian Old Testament and the Torah, the Jewish holy texts attributed to Moses. The story itself is fairly basic: It’s been seven generations or so since the whole mishap in the Garden of Eden and God is fed up because the “world is full of wickedness.” He decides to wipe out the Earth with a massive flood but also to save the one decent man from the devastation. 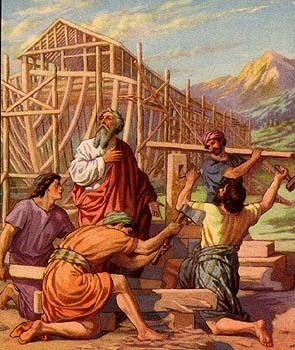 This man is Noah, who, along with his family, is instructed to build a massive ark in which to ride out the flood accompanied by two of every animal in the world. Noah does as he’s told and he survives the waterlogged end of days. In the end, God presents Noah and his family with a rainbow as a sign that he loves mankind and will never do something that genocidal again. 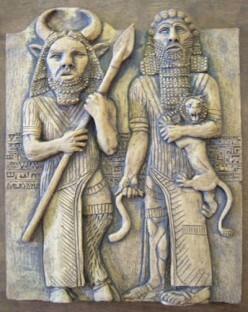 Giglamesh (right) pictured here with his bro Enkidu. The story is a simple morality fable but it’s got a few more layers to it. Specifically, it’s one of those rare Bible stories that may have a basis in fact. If other religions from the Fertile Crescent, the region between the Tigris and Euphrates Rivers (located in modern day Iraq), are any indication then the Flood Myth is fairly ubiquitous across the board. Even the Saga of Gilgamesh, a Sumerian epic and quite possibly the first of its kind features a tale where the protagonist encounters a survivor of “The Great Deluge.” Between that universality and some geological evidence it’s quite possible that the Fertile Crescent really was beset by a massive flood at some point in the distant past. But that still doesn’t explain the stuff with the angels and the fire sword and the like. For that wackiness we need to turn to Deuterocanon. Deuterocanon refers to the various collections of writings by Hebrew and Christian authors that are considered to be non-canonical to official teachings. Perhaps the most well-known instance of Deuterocanon is the Book of Enoch. The Book of Enoch is a collection of writings associated, aptly enough with Enoch, the grandfather of Noah. The book retells a number of tales from Genesis including the Flood Myth, but it goes into much greater detail about the world surrounding them. The author details such events as the Fall of the Watchers, the creation of the Nephilim and other decidedly more fantastical stories about Earth before it started raining. As luck would have it, it seems as though Darrin Arronofsky is drawing from the Book of Enoch as a source of inspiration. Let’s dive right in, shall we? Very like a Nephilim but not quite. Still cool though. Let’s start with that scene of angels plummeting to Earth. This is most likely a reference to the Fall of the Watchers. The Watchers themselves were angels who took a decidedly more active role in serving as God’s sentries on Earth. That is to say they actually roamed the Earth among humanity. The problem is that apparently the Watchers had a thing for human women and began to lust after those over whom they were charged. Their desire eventually resulted in beings often called the Nephilim, who were the offspring of “sons of God,” and “the daughters of man.” The Nephilim are often characterized as giants who possessed tremendous strength and power not unlike the Norse Jötunn or the Greek Titans. Enoch goes on to say that the Nephilim were at least partially to blame for God sending the flood to cleanse the world. That said, recent modern interpretation is that the Nephilim may have been the sons and daughters of local lords who were given to abusing their powers, but I wouldn’t hold my breath for something so mundane to appear in this adaptation. But if the movie’s IMDb page is anything to go on, the angels themselves aren’t going to be the primary threat. It’s looking like that role falls to Ray Winstone (known for his role in Beowulf) who will be portraying a figure named Tubal-cain. The smart money says he's the guy with the fire sword in the teaser. Tubal-cain is actually referenced at one point in Genesis during one of those long-winded genealogies that Moses was so fond of writing and that God was apparently fond of imparting upon his charge. Rashi, a well-regarded medieval French rabbi, interpreted Tubal-cain’s name to mean “he who spices the craft of Cain.” Cain, of course, was one of the two sons of Adam and Eve who killed his brother Abel in a fit of jealousy, thus committing the first murder. Rashi and other medieval theologians have interpreted Tubal’s name to mean that he was a blacksmith or maybe even a metallurgist due to references about his work with copper and iron. Made with the expressed purpose of hurting you. For this reason, and given his role in a brief passage called the Song of the Sword, Tubal-cain is often believed to be the inventor of the sword, the world’s first true weapon. Apart from the sword, every ancient weapon from the axe to the bow and arrow were adapted from a tool used for another purpose. The sword, though, was made for killing other people. Because of his creation, Tubal-cain is often considered to have added the next layer (or spice if you will) to the craft that Cain created, which is…say it with me: murder. Combine this ominous legacy of violence with the film’s more fantastical approach to the adaptation and it’s easy to see why Aronofsky chose Tubal-cain to be his antagonist. So why does all of this matter? Well, because in my opinion, Noah has a real good shot at being a great movie. It’s got a good pedigree of actors, a director with a reputation for creative ideas and presentation, and it’s drawing from some fascinating source material. And that source material is worth knowing. Not because it’s an integral part of the Abrahamic faiths, but because it’s a fascinating mythology, at least on the level of anything the Greeks or Norse came up with. That it’s tangentially related to faiths that are still being practiced is just icing on the cake, for me at least. Either way, join me next time as we talk about words and genres and stuff.